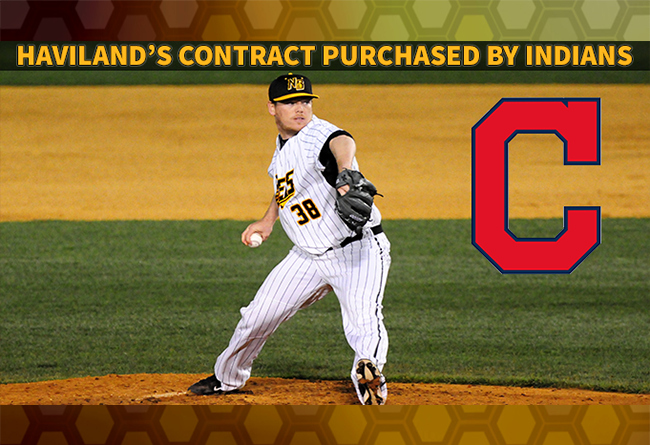 (New Britain, Conn., Aug. 3, 2016) – New Britain Bees team officials today announced that starting pitcher Shawn Haviland has had his contract purchased by the Cleveland Indians organization. He will report to Columbus (AAA). Haviland, 30, started the season as a member of the Bees bullpen and was the first player in team history to make a relief appearance. The 6’2”, 200 right hander transitioned to the starting rotation full time after Josh Zeid’s purchase by the New York Mets, making 13 starts and tossing 94.1 innings for New Britain. The former farmhand of the Oakland Athletics, Chicago White Sox, and Boston Red Sox struck out 70 batters and pitched to a 3.33 ERA, good for seventh in the Atlantic League at the time of his purchase. Haviland is the sixth Bees player to have his contract purchased during the 2016 inaugural New Britain season, joining Nick Greenwood (Minnesota), Josh Zeid (New York Mets), Josh Outman (Pittsburgh), Cole Johnson (Arizona) and Eric Fornataro (Baltimore).